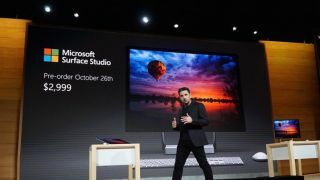 Panos Panay, Microsoft’s corporate vice president of devices, has vehemently denied that the company is planning to stop selling Surface devices in 2019. However, Panay, speaking at an event, stated that this was “so far from the truth,” and that it was simply a “tabloid rumor of the week”. Of course, it’s likely that Microsoft would dismiss talk of it dropping its Surface products regardless of whether or not it actually was going to do that. It’s widely believed that Microsoft will announce a new LTE-enabled Surface Pro tablet later this month, and any talk of Microsoft dropping Surface products could hamper sales, as consumers won’t want to pay money for a product that may cease to be supported in the near future. Sales of previous Surface products, such as the Surface Laptop and new Surface Pro, haven’t been brilliant, and there was another blow earlier this year when a report suggested that Microsoft Surface devices come last in reliability. We genuinely like many of Microsoft’s Surface devices – the Surface Pro currently sits at the top of our best Windows tablet list – so we’d be sorry to see them disappear. Panay’s comments have helped alleviate our fears somewhat, but with the death of Windows Phone still fresh on our minds, all this talk could still be a bad omen.